San Luis Obispo County extends from Ragged Point north of Hearst Castle down the coast to the Guadalupe Dunes south of Pismo Beach. Part of the coastline is off-limits, occupied by the Diablo Canyon nuclear-generating plant (which is being decommissioned), Even so, along the rest of those 90-some miles you'll find a wide variety of beaches that you'll love to visit. These beaches are listed in geographical order from north to south. The only sunbathers on the beach at Piedras Blancas north of Hearst Castle are likely to be elephant seals. They give birth there, raise their babies and mate. The young males learn to fight on the beach, and they all come back to molt and rest. The rookery is open for public viewing and just a short walk from the parking lot on a flat, level boardwalk. Most people have heard of Moonstone Beach in Cambria because of the cozy hotels that line the road nearby. Moonstone Beach has a little of everything: an easy clifftop boardwalk that's easily accessible by wheelchair or ECV, tide pools, surfers, crashing waves and golden-colored cliffs above the rocks. There's also a restaurant right across the road with a large outdoor deck. Popular with locals, the town of Cayucos is small and fun to walk around in. The beach is right in town: wide, sandy and fairly flat, with a pretty pier in the middle. It's a good place for sand play, with lifeguards on duty in the summer and an outdoor shower in case of big messes. You can find lots of places to eat and drink in town, only a block or two away. Follow Embarcadero Road through Morro Bay, along the waterfront toward Morro Rock or take the trolley to reach this multi-faceted beach area. There's a skateboard park and small playground for the kids, good fishing and sea otter-watching off the rocky shore and a lovely sandy beach opposite, where you can surf (or watch the surfers) and play in the sand. This spectacular park just north of Morro Bay is a favorite for photography. The best beach in the park is Spooner's Cove, directly across from the campground. It's a perfect place to enjoy the rugged coastline, but the beach is a little rough for bare feet. The sand dunes outside of Pismo Beach are a great place to play - and the only place in California where can drive your RV or travel trailer onto the sand and camp in it there. You can drive your car onto the beach, too. You'll find lots of dune buggies running around the dunes. 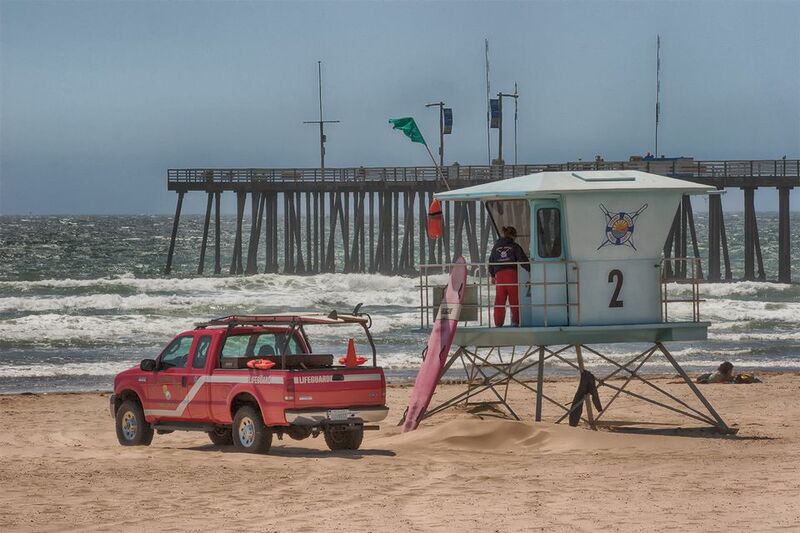 The only place in California where you can drive your camper onto the sand is in Pismo Beach at Oceano Dunes. Camping at the dunes is fun, but there are things you need to know. You can find out about all of them in this guide to camping at Oceano Dunes.